How fast 2013 has gone and how quickly the holiday season is passing. 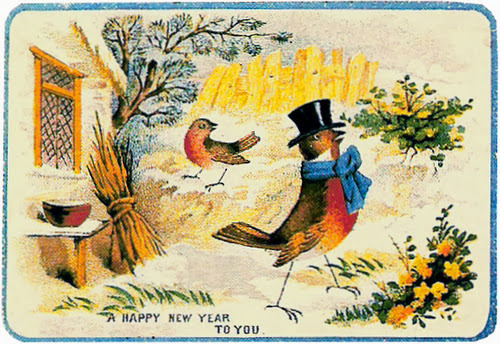 Best wishes to you all and hoping for a wonderful 2014. This is me 1961 at Toyland on the top floor of Pomeroy's department store in Reading, Pennsylvania. Santa was in the corner of the floor so you could see him as you walked around the toys and the animated Christmas figures. I thought I was in heaven. 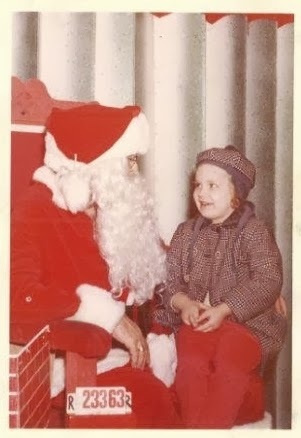 And by the look on my face I had a crush on Santa. Notice the cute cat and coat combo. I loved that coat and sure wish I had it now. The coat and hat were in a box of clothes some "rich people" would sometimes give to my dad for his daughters. It was like gold when he would get a box of clothes. Christmas past was the most fun ever. Right? 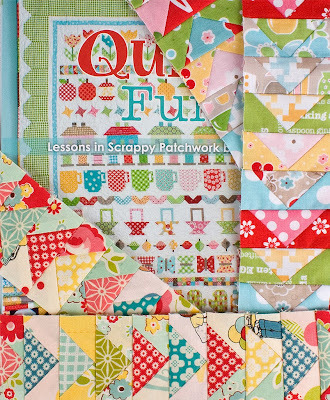 It is time for another week of Quilty Fun using Lori's book. You can get the details at the Jolly Jabber, Pam Kitty Morning's blog, or from Lori herself. Pam of PKM fame is hosting the cute little mug/cup this week. You can see Pam has her work all set out and ready to sew. Pam has all the particulars for making this cup on her blog. The cups are so cute in any fabric. Jolly Jabber posted this pic. These are my mugs from when I made the row along. Yikes my threads look so messy on the black background. Oh well. 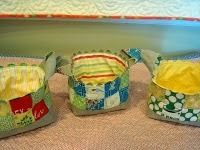 The cups sew up super fast and are a delight to make. 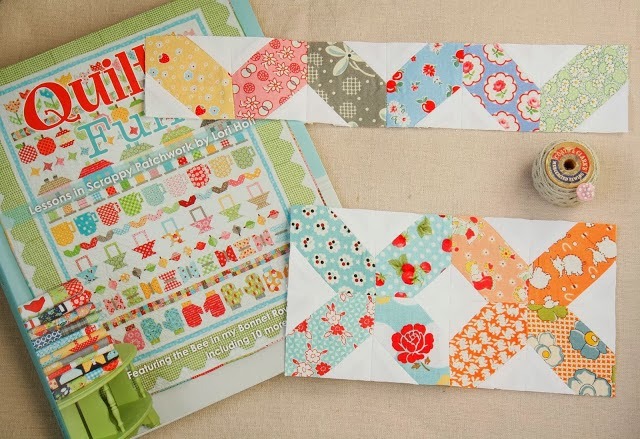 It is Erin at Why Not Sew's turn in the Quilty Fun Blog tour. Erin is amazing. 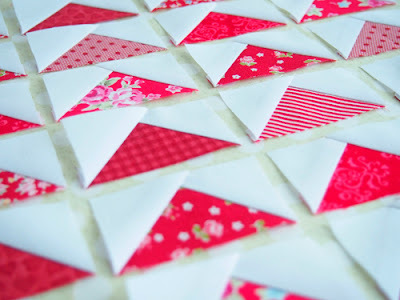 She has a fabulous blog and you will want to go check out her cute chevrons. I wish they were mine. I love all the fabric Erin chose. I'm really stuck. I'm stuck like in the movie "Groundhog Day". I mean every day is mostly the same. I am pretty frustrated with my ailment and I'm determined to get myself well. But I haven't seen progress yet. And so I feel stuck and in almost constant pain. It makes me sad not to be able to sit at my sewing machine and participate in my normal everyday life. And it has made me aware that I shouldn't take those things for granted. I was looking for a specific picture on my blog the other day and browsing the archives. I realized I could be working on this project. 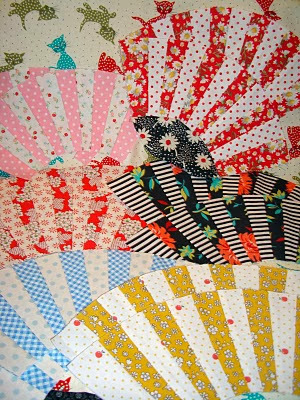 I could be doing some applique. 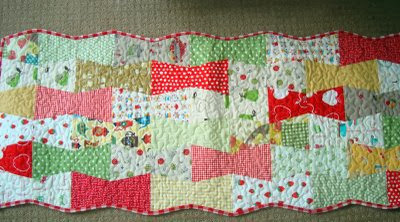 And I should be working on old projects with applique like this one, too. I'm really not motivated but I need to motivate myself to distract myself from the pain. Right? While browsing for that picture I found a few pictures of baskets I had made. I forgot I even made these. What did I do with them? I must have given them for gifts. I forget. 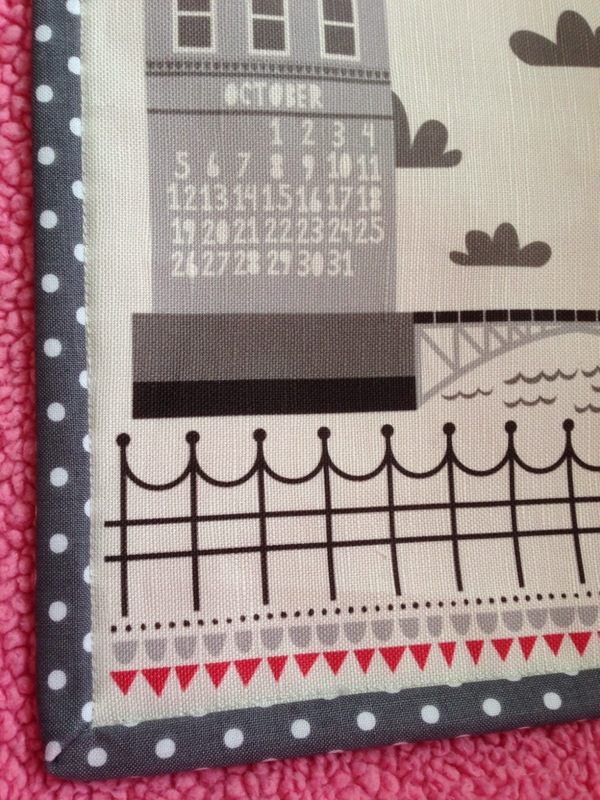 I found this table runner. I absolutely do not remember even making this. At all. I actually found lots of projects in blog archives I made that I forgot making. Weird. I'm old I guess. 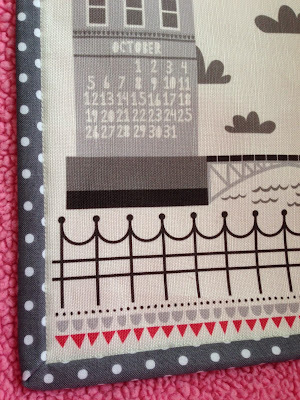 I don't remember making this table runner either. Where did it go? Is it living somewhere? Like I said..old. 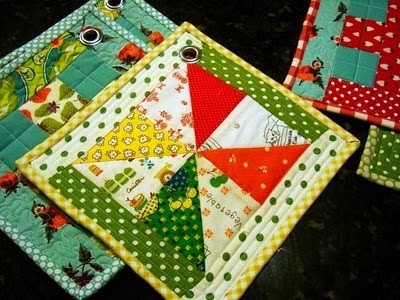 And these potholders I made...they were obviously gifts. But where are they now? Do you feel like that sometimes? Like you've made projects and forgot making them or remember making something and wonder where it lives now? 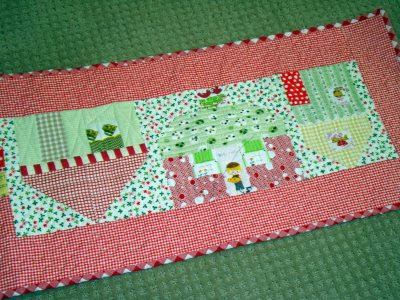 In 2005, I think, I made lots and lots of baby quilts that I sold. I wonder where those quilts live now. I'm kind of going crazy. I think you can tell. It is week 5 in the Quilty Fun Blog Tour. This week it is Flying Geese. I really like Lori's method of flying geese. Pretty by Hand is hosting the flying geese this week. If you've never visited her blog. Please do so. You will be overwhelmed by the talent and projects shown there. She's amazing. 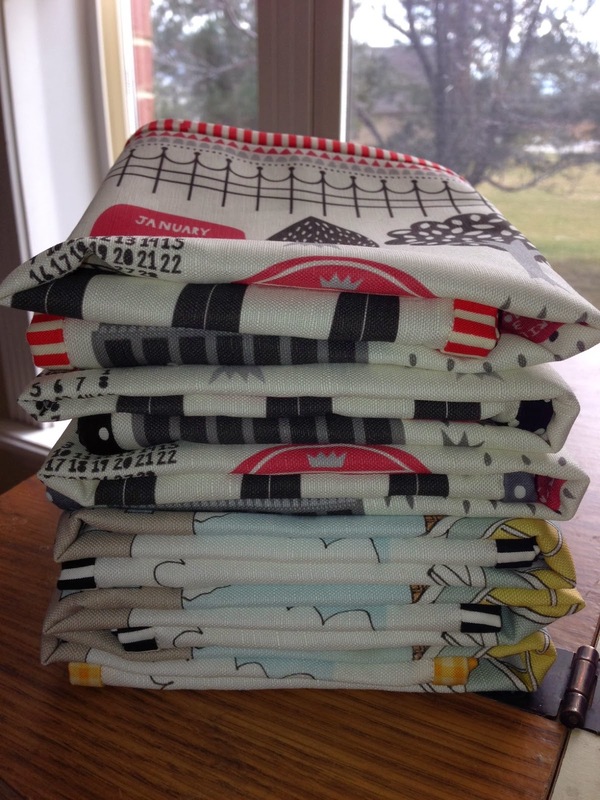 I swiped this photo from her blog but you've gotta go over and see her work. If you're participating in the blog tour, you will want to make the next step. The flying geese are crisp and lovely. Really they look like you could frame them. First of all thanks to those that participated with me in the basket block from last week and posted blocks on Flickr. 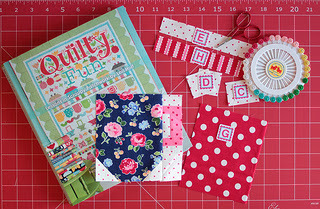 Fat Quarter Shop will contact the winner. I've had a few rough weeks here at the Hive. I'm ending the year with an injury that has taken me off the sewing field. I'm glad I've been ahead of the game this year in scoring my Christmas projects. I've missed being able to do work on my projects but I do have an easy gift to show and tell. 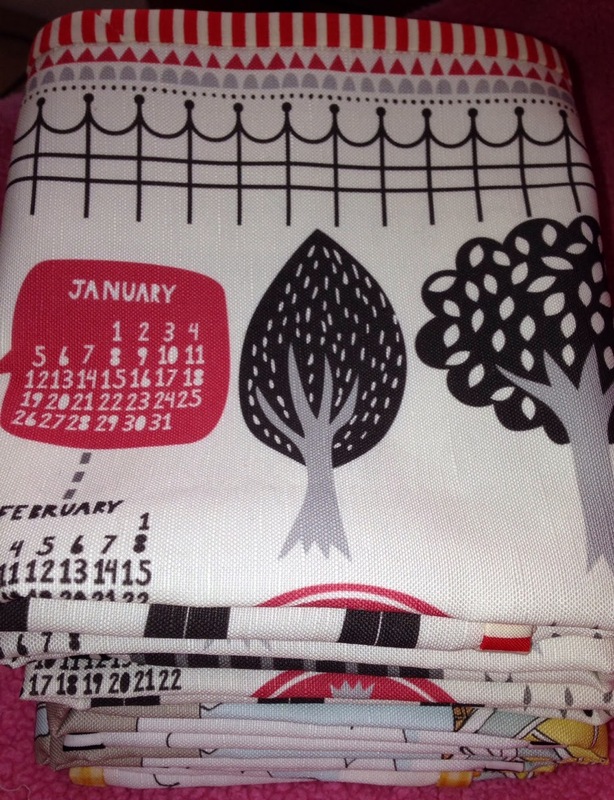 Last year I purchased yardage of linen/cotton blend calendars for kitchen towels. They make a great gift. Everyone always needs a new kitchen towel. So this year I decided to repeat my gift idea for 2014 calendar towels. I stacked some of the towels I bound by my sewing room window. It is always nice to look outside while I sew here. 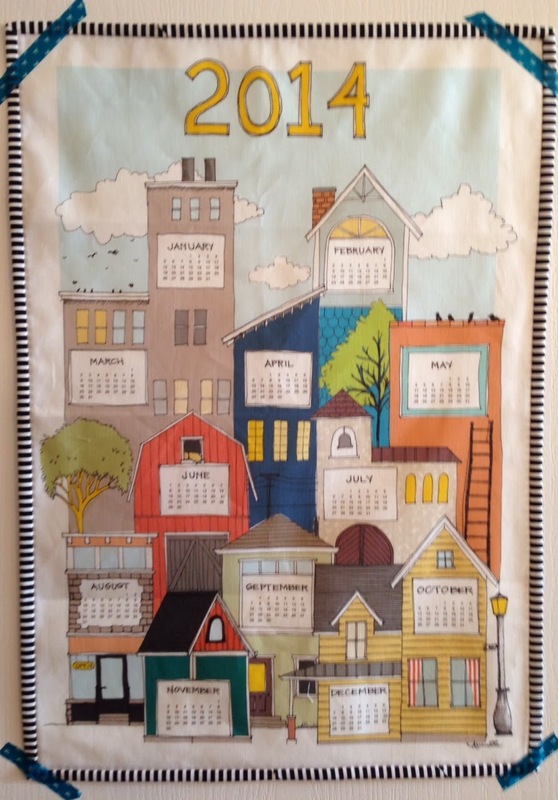 Every year Spoonflower has a contest where artists submit their designs to Spoonflower for fabric calendars. I always vote and enjoy seeing the wide range of designs. It can be hard to pick a favorite. 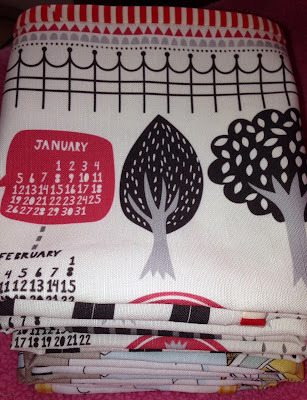 One yard of calendar fabric gives you 4 calendars to cut apart and bind. 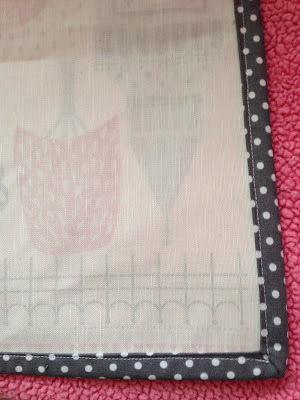 I find this project a very easy one to machine stitch my binding. 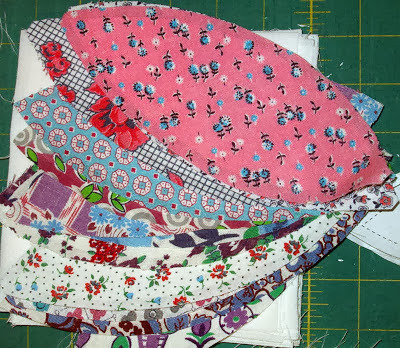 By pressing the the binding carefully I can stitch in the ditch and catch the binding in the back with a smooth and even stitch. This is one of the towels I bought from Spoonflower. I thought the houses and barns were a good design after making a barn quilt and making houses on various projects this year. 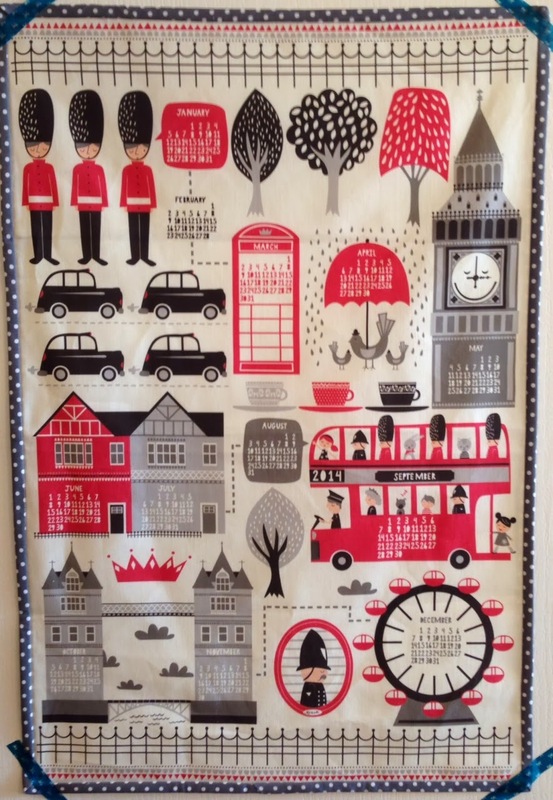 I found this British design very fun since the designer had much the same idea that I have had with my London quilt. I really loved seeing her take on all things London.